Women’s Doubles in divisions by age and level of play. Play levels will be verified. Team must play at highest individual rating and/or lowest age group. A 10-point tie breaker will be played in lieu of a third set. Trophies are be awarded to champions, finalists and consolation winners in each division. A consolation round assures each team of playing at least two matches. Presented by Sun Trust Investment Services, Inc.
$30 person (not included in player registration fee) includes 2 drinks and Hors d’oeuvres. Kickoff Party tickets will be available at the door. Player entry fee includes admittance to party with light cuisine, cash bar, drawings, silent and live auctions. Snacks, Cash Bar, Local Tennis Celebs, Fun! Breakfast and lunch provided for players. 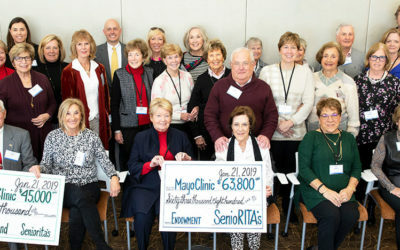 A complimentary Margarita for each player provided by SenioRITAs at Sawgrass. 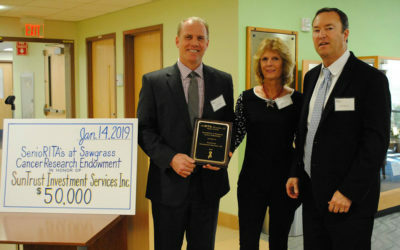 Karen Aaro, co-chair and Joe Carnley and Jack Morey of SunTrust Investment Services announce the $ 50,000.00 SenioRITAs at Sawgrass Cancer Endowment in Honor of SunTrust Investment Services ....long time Title Sponsor of the Kick-Off Party at Pusser's Caribbean Grille. 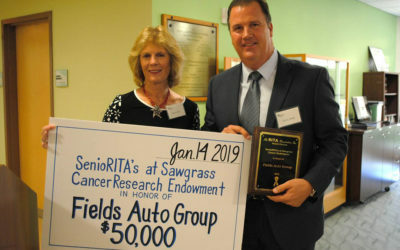 Karen Aaro, co-chair and Garry Redig, COO, Fields Auto Group announce the $ 50,000.00 SenioRITAs at Sawgrass Cancer Endowment in Honor of Fields Auto Group., Title Sponsor of the SenioRITAs at Sawgrass Women's Tennis Tournament.